Not all of your foes will appear in their true form. You must learn to trust your instincts. Only at the moment when her mortal heart ceases to beat will her destiny ignite and the strengths of the Oracle become free. This will be the future, or your beloved Tartarus will decay beyond repair, and you will be responsible for its extinction. Kristin Cast's New Adult paranormal romance is perhaps a bit cheesy, predictable and frustrating to read at times, but it's also quite fun in a guilty-pleasure kind of way, and it seems like a promising beginning to a great new series. 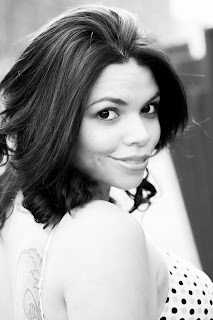 I think fans of House of Night universe will definitely appreciate Cast's new series. 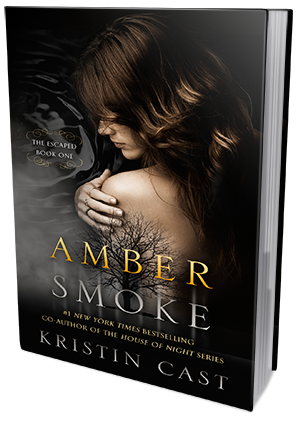 Amber Smoke offers a pretty unique twist on the Greek Myth about Furies. The story doesn't focus on the Furies themselves, though they do appear in it every now and then, and they play quite a significant role. The world-building is on a decent level - we get plenty of interesting details, though the descriptions of people and places are somewhat lacking. Undeniably, there is a whole lot of meaningless chitter-chatter and plenty of unnecessarily dramatic and/or awkward situations. The unevenly paced plot line is pretty hard to follow at first. Not much is happening for almost 1/3 of the book, instead we get to witness our lead characters, Eva and Alek, making a series of really bad choices that make you wonder about their IQ levels. However, once the action picks up and things start happening, the book gets much more interesting and definitely more fun to read. I really enjoyed the mythology in this book and wished more time was spent on exploring the parallel universe. I liked the premise of this story and the part about one of the Furies breaking the rules and falling in love with one of the damned ones. While pretty superficially described, the scenes that took place in the prologue were fascinating and interesting to read. As far as character development is concerned, I thought Kristin Cast could've done a better job. Both Alek and Eva seemed so stereotypical and, unfortunately, very childish and silly. These two had no common sense whatsoever. Eva would park her car in a dark and empty alley, leave the door unlocked and then get into the car without checking the backseat. Alek would get tangled in all sorts of awkward and frustrating to read situations that were probably supposed to be funny, but really, they were excruciating to read. The truth is, I didn't like these two at all. I couldn't relate to them, and therefore, I didn't feel invested in their story. I kept reading, because I wanted to find out where the story will go. Overall, I don't regret finishing the book. The cliffhanger ending made me want to jump straight into volume two, which is a good sign. I think this is a pretty good story for anyone who enjoys paranormal romance stories and doesn't mind cheesy sense of humor and a bit of awkwardness. This is somewhere between 3 and 4 stars for me. 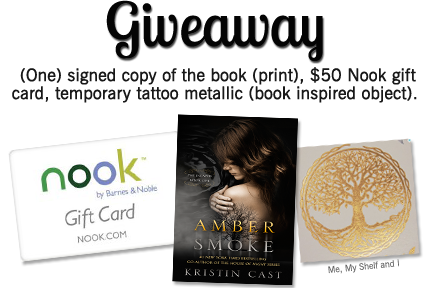 One winner will get: (One) signed copy of the book (print), $50 Nook gift card, temporary tattoo metallic (book inspired object). US only.